We approach the subject in the light of what can be called the Lord of the Flies principle, after the famous novel by William Golding in which a group of schoolboys is marooned on an uninhabited island after a plane crash. Lord of the Flies depicts the boys' horrifying and all-too-believable regression to a state of savagery and blood-lust. A superb mix of psychology, history, and nail-biting storytelling, No Mercy investigates historical instances of disaster and asks, "How far would you go to survive?" No Mercy looks at what happens to human beings when disaster strikes: how they tackle the task of survival, how they change, how they treat their companions. No Mercy covers the infamous Robbers Cave experiment in Oklahoma in the 1950s, the wrecks of the Batavia in 1629 and the French vessel Medusa off Mauritania in 1816, the Chilean mine collapse in 2010, and many more disaster situations. The authors examine the factors that lead to failure or success and how they are explained by modern neuroscience. 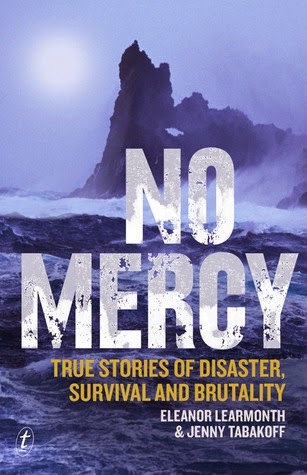 No Mercy: True Stories of Disaster, Survival and Brutality by Eleanor Learmonth and Jenny Tabakoff is a very highly recommended, thought provoking look at how groups of people act and the extremes they will go to in order to survive during a traumatic event, such as a ship wreck or plane crash in a remote area. Why do some people work together and survive the disaster with fewer fatalities while other groups disintegrate into stupidity and violence? Learmonth and Tabakoff note in the prologue that, "This book considers numerous such examples of the Lord of the Flies principle in history. We focus on predominantly adult groups who found themselves stranded and in conditions of extreme stress at dates between 134 BC and 2010 AD, in remote locations across the globe. Several of these episodes will be considered in depth; others will appear as we look at the factors that seem to dictate the survivor groups’ behavior and dynamics. We analyze the twisting path of social disintegration with reference to other failed groups—some famous, others relegated to the dusty, forgotten corners of history." I was engrossed in each tale of survival (or not) and the various actions each group took. "While almost every disaster has a degree of stupidity at its core, it is how the survivors behave and respond that often separates the living from the dead." The authors point out that some of the stupidity is actually the result of a built in neuro-chemical reaction that we have no control over. "While the other case studies we have considered can easily be categorized as abject failures, this example shows that a group can sidestep the Lord of the Flies principle even in the harshest of circumstances." In this chapter it was also interesting that many survivors talk about an ‘unseen presence’, which felt malevolent for some and a comforting guardian angel to others. This has been named the Third Man Syndrome after Shackleton’s encounter. This is really a compelling, fascinating, dramatic look back at the social decay and implosion that occurred in various groups of people under extreme stress. It proves "Golding’s overarching concept that the primary thing from which the group needs protection is itself." Disclosure: My Kindle edition was courtesy of the Text Publishing Company for review purposes.